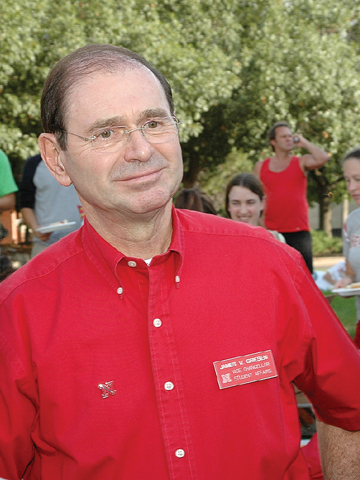 Position Change - James Griesen will retire as Vice Chancellor for Student Affairs on June 30. Griesen has served in the post since 1986. He will continue to teach at UNL. James Griesen is a man people don't mind waiting for. UNL scientists looking to fill gaps in basic understanding about gold's structure at the nanoscale have turned up a full-sized and surprising discovery - hollow cage-like structures made of pure gold atoms. Hardin Hall will be rededicated after months of renovation at a ceremony and open house beginning at 10:30 a.m. June 13. UNL's core values may not be new. But they're newly articulated. Construction of the International Quilt Study Center began officially with a May 12 groundbreaking ceremony. The quilt exhibition "Perfecting the Past: The Colonial Revival and Quilts" will be on view through Sept. 1 at the Robert Hillestad Textiles Gallery. Quilts from the collection of the International Quilt Study Center are on display to show how the Colonial Revival movement (1880-1930) affected pattern, color, and style choices in the 19th and 20th centuries. Along the north side of the Platte River near Plattsmouth is a pit in the earth called the Gwyer Quarry. It contains a deposit of buff-colored limestone that supplied the rough-textured, irregular stone for Lincoln's old city hall, built in 1874 between Ninth and 10th streets. Images from along a centuries-old silk trading route in China are coming to the Lentz Center for Asian Culture and the Great Plains Art Museum. The Nebraska Repertory Theatre, the professional summer theatre of the Johnny Carson School of Theatre and Film, has announced its 39th season. The Sheldon Memorial Art Gallery's annual statewide exhibition will focus on the link between music and art. A premiere benefit of "A Prairie Home Companion," the movie is 7 p.m. June 9 at the Mary Riepma Ross Media Arts Center. Gardeners who've fought Creeping Charlie and other unwanted plants may sympathize with James McKean from Iowa as he takes on bindweed, a cousin to the two varieties of morning glory that appear in the poem. It's an endless struggle, and in the end, of course, the bindweed wins.